A double walled ceramic mug, it's the Looney Tunes Tasmanian Devil Travel Mug with Handle! The mug holds up to 14 ounces of liquid. The Looney Tunes Tasmanian Devil Travel Mug with Handle fits in most vehicle cup holders and is both microwave and dishwasher safe. 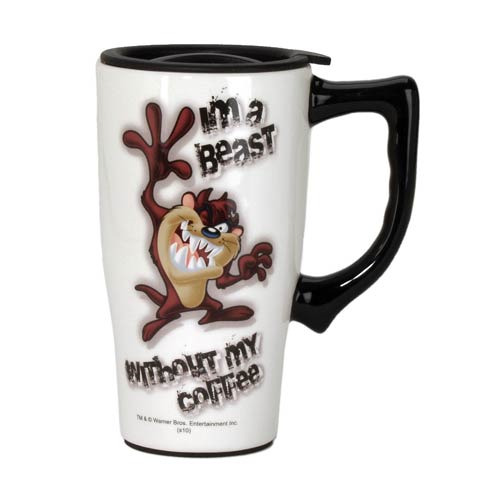 The mug features an angry looking Taz from Looney Tunes over a white background with the words, "I'm a beast without my coffee."